Friend Gail Nicholson realized one day a few months back that I had never read COME SPRING by Ben Ames Williams. She appeared the very next day with a brand new copy for me. I finished all 866 pages last week–published by the Union Historical Society–and enjoyed the read. 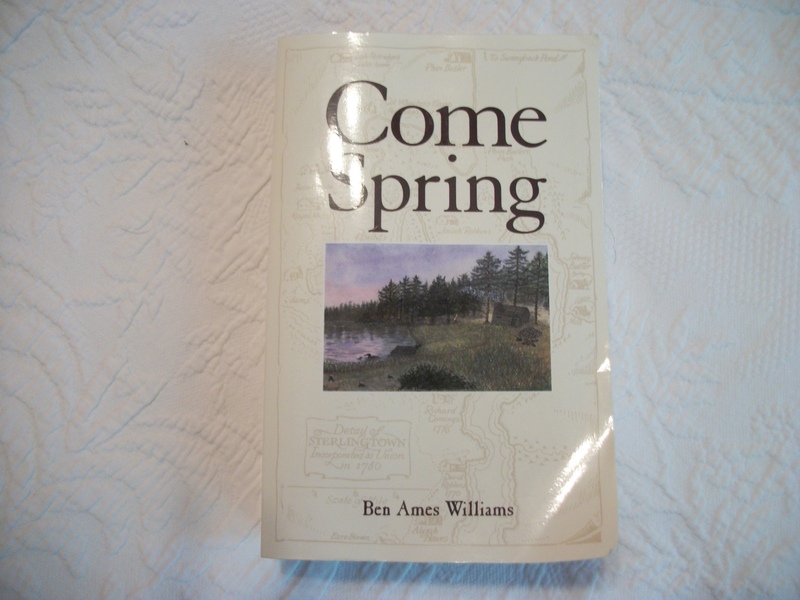 Ben Ames Williams wrote COME SPRING in 1940. It’s a specific story of how in 1776 (the same year the Declaration of Independence was signed), the first settlers moved up the St. George River of what is now called mid-coast Maine, and cleared and settled land in an area now called Union, which is just above the coastal town of Thomaston and the next settled village up the river, Warren. COME SPRING is a general story also of how settlers dug in, cleared land, and made a life all across New England. Or, not, as not all settlers were successful. Some didn’t have the temperament to be in what was wilderness for long periods of time; others just had bad luck–spouses who died, barns that burned, crops that failed, game that couldn’t be found in the winter, and so forth. And COME SPRING is a story of how all of these people related to the ongoing Revolutionary War and, after the war ended, how newly formed civil organizations started making laws and levying taxes, when these early landowners had no hard money or paper money to give. COME SPRING is also a love story–written by a man and with a woman heroine (Mima). . It’s the story of Mima’s love of the man she chose and for whom she waited, of her desire for a family with this man, and of her love and deep connection to the land she intended to work hard to settle and to hold in her family forever. Mima is much more interested in intimately knowing her own surroundings then she is in outside political realities and forces, which she believes she can do nothing about and which just get everyone all upset when learning of them. Settlers could use the river to travel back to the coast and civilization–except when the ice wasn’t firm. Otherwise, they had to walk everywhere they went. Early settlers were lucky to have a pair of oxen or a few chickens or some sheep which would mean wool for clothing. Mostly all the clearing work was done without such help. Several barn raisings are described in the story; it takes a lot of strong men to raise a barn, so such an occasion brought the community together for the day of the raising. What’s fun, if you live in this area, is the name recognition–many of these original families are still here and place names taken from these first settlers abound. Union’s quilt chapter is “Come Spring.” There’s also a Union diner called “Come Spring.” And, this summer, someone wrote a kind of short play taken from COME SPRING featuring some of the key characters that was read by people dressed in period clothes in the center of Union. When spring came in this early Maine, green food returned as the snow melted, animal babies were born, crops could be planted, hope of survival could be renewed. Union is also the home of today’s week-long Union Blueberry Fair in mid-August, which has 4-H contests, animal pulling contests of all kinds, farm demonstrations of all kinds, a midway, and harness racing where you can make $2, or more, bets. We LOVE this fair and go every year. When one of the main protagonists, Mima’s father, dies in 1816 at age 86, he is survived by, writes Williams, “six children, fifty-one grandchildren, eighty-five great-grandchildren, and five great-great-grandchildren.” Only three of his children and fifteen of his grandchildren died before him. These numbers were needed for survival in the wilderness, for creating a town, for moving on to create a nation that stretched from shore to shore. These kinds of numbers make me pause to think about some of our current rhetoric of how long we’re all living. We may be reaching this age, but are we reaching it with the same kind of health that Mima’s dad enjoyed? He moved to the wilderness of Maine when he was 45 years old. “I think sometimes getting old is like a candle burning down. A young one grows up and the first thing he knows he’s in love and marrying; and you can see something new in his eyes, deep and strong. That’s like a candle when first you light it, standing up so straight and white and slim and fine; and the flame’s real pretty to look at. “But the candle burns on. Maybe it melts crooked, but the flame stays just the same shape and brightness. Maybe if the wind blows, the flame flutters some; but when the wind stops, the flame’s just the same again. The candle keeps a-burning, and the tallow runs down the sides of it, and it gets all lumpy and out of shape like a woman after she’s had babies for twenty years, or a man that likes his victuals. Like all historical fiction, the story tells a reader much more about William’s 1940s than it does the 1780s. Williams does use archival materials to write this novel. There are several journals that derived from this area, for instance. But the sentiments he overlays onto Mima et al are very much those of the 1940s–which is why historians view historical fiction with a skeptical eye and argue that this overlay does a kind of violence to the real people who lived those very real lives. Nevertheless, it was fun for me to read what was of concern to Williams, what he wanted his characters to think and feel, and to compare how those values have shifted so enormously today–and not in good ways, I’d say. So, thank you so much Gail!